At Mecklenburg Automotive & Collision Center, we want to be your solution to any transmission problem your vehicle may have. Our ASE Certified technicians and professionally trained service advisors offer a full suite of transmission services to ensure your transmission system is back to it’s high-level of performance. Whether you need a transmission flush or a filter replacement, know that our automotive team will have the technical experience your vehicle needs! Does Your Transmission Need Service? Outside of having your transmission system regularly serviced at our shop, the next best thing to prevent any major issues from occurring is to understand the signs of degradation and failure. When your transmission system starts to fail, there are a few telltale signs you can look for that’ll give you a slight indication of what’s going on. Although you may not fully understand what’s going on, informing our ASE Certified technicians of the symptoms will help make the service easier! By knowing these signs, you’re already taking the steps needed to ensure your transmission system will be properly serviced and functioning once more! This is a very common and easy symptom to notice, and you should act as soon as you see this. Why is that? Well, unlike motor oil, transmission fluid is not consumed or burned during use. The fluid level should remain the same regardless of how long the fluid has been in there. If you notice the fluid level drop or if there’s a bright red, sweet-smelling fluid found underneath your vehicle, those are clear signs that the transmission fluid is leaking. There are a variety of reasons that this issue could have occurred, so it’s best to visit our shop and let our automotive team take a look. We’ll be able to properly assess what’s going on with your vehicle and provide it with the transmission service it needs. Another easy symptom to look out for, you’ll notice this when you feel any sort of hesitation or hitching when you shift gears. 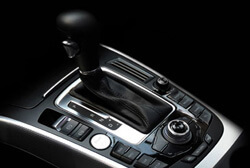 The transmission system was designed to smoothly shift from one gear to the next, and any type of delay is a clear sign of transmission failure. Automatic drivers will notice this symptom when they transition from “Park” to “Drive” and vice vera, while manual drivers will notice this when they are shifting gears in general. Please visit our shop as soon as possible if you notice this symptom! This can be very difficult and dangerous to drive with and can cause serious damage to your transmission system if not promptly handled. Book Your Next Transmission Service! If you notice that your vehicle’s transmission system is starting to fail, it’s best to not let the issue persist. For the best transmission services in Charlotte, NC, make sure you visit Mecklenburg Automotive & Collision Center! Our ASE Certified technicians and professionally trained service advisors will have the services your transmission system needs to perform at its best, all at an affordable and practical price. Give us a call at 704-461-2077 or visit our shop at 3227 Wilkinson Blvd and schedule your next transmission service with us! If you have any questions about your transmission or our services, please give us a call or stop in today!